Your tuition money goes into a stinkin’ sign! A sign! This sign, which I pass every Monday, Wednesday, and Friday, is a monstrosity. There have been THREE (yes, three) different versions of this sign throughout the course of this semester. The first sign was put up during the summer. It featured everything that the sign at right says, except that it was a whole lot bigger, and had instead of such simple block letters, big fancy letters. 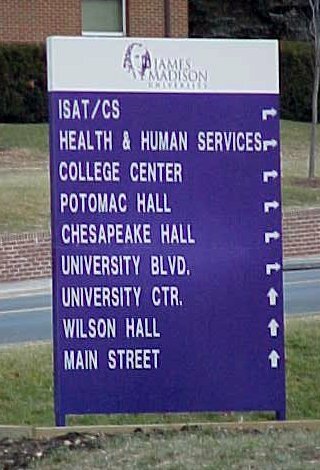 But it said the exact same thing… ISAT/CS, College Center, Potomac Hall (that one’s important – how else would I know where I live? 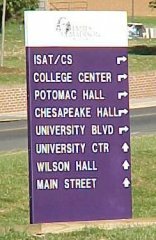 ), Chesapeake Hall, University Boulevard, University Center, Wilson, Hall, and Main Street. Yes, it’s important to know where you are going at JMU, because our campus is spread out. One sign is all right – but three? First of all, the sign has that hideous new James Madison University logo on it, which features James Madison’s disembodied head on a bad hair day. That’s bad enough. Secondly, if any privately-owned company made such a mistake, they would be killing themselves over it, I’m sure. The second sign, which is the one at right, is the second in the series. It was smaller than the first one, and featured block letters. 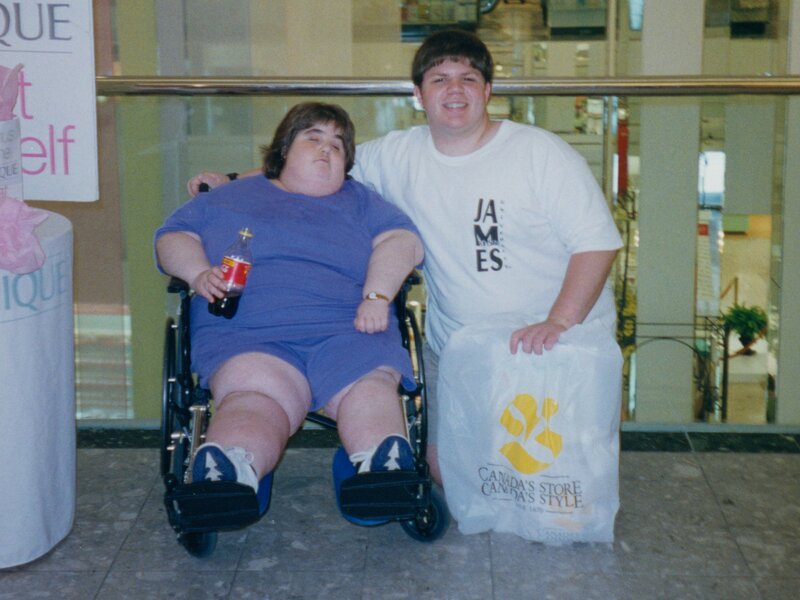 Still, isn’t that enough? I’m afraid not – seems that they forgot to include something. They forgot to put “CISAT A-2”, which is also known as “Health and Human Services”. However, everyone I know calls it simply “the new part of the ISAT Building”. You may notice this phenomenon in my “Fire Alarm in the ISAT Building” photo essay, whereby although more than half of the building is officially not ISAT, it’s still considered ISAT to most of us. But of course, this slight oversight is worthy of a new sign! An entirely new sign! This new sign is the same height as the old one, but is wider, and also uses narrow type on the sign itself, and smaller areas. All in all, it seems highly unnecessary, since the “Health and Human Services” building (which, by the way, is still incomplete), is part of the ISAT Building. And then we all wonder why JMU is determined to milk us for all we have in the bookstore, at the copy center, in the vending machines, and even in the general computer lab in the ISAT Building (technically “Health and Human Services”), where printing is six cents per page. The answer is, if JMU would do something useful with their funds, like perhaps fund their programs sufficiently so that we don’t have to buy $17.00 lab vouchers just to sit in the planetarium and look at stars. And if we don’t pay the exorbitant fee, God forbid, we’ll be administratively dropped from the class. So… this is a monstrosity of the first degree. This hopefully will be the last sign (i.e. they finally got it right). But if not, I won’t be surprised. Notes: JMU just can't keep their hands off that sign. Over Christmas 2000 it was replaced with one with the writing in a "Times New Roman" style. However, since then, they seem to have left the sign alone.